Nibbler takes the original game idea from games like Blockade (1976) of a snake which gets longer the more it eats in a big open space, and takes it one step further. Set in a maze, you must guide the snake through the twists and turns to eat all the food. For each item of food the snake eats, pieces are added to its body. This makes the snake progressively longer and therefore harder to control to reach the next piece of food. All the while the snake is moving around the maze at a fairly fast pace, and is unable to stop at all. The snake must eat all items of food onscreen to complete the level, but is not allowed to come into contact with any part of its own body which is following it through the maze. Doing so causes the loss of a life. 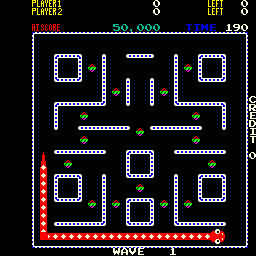 As you advance through the levels the screens stay in a set pattern, but Nibbler moves faster and faster. Quick reflexes are required, as although there are only half a dozen maze layouts, manoeuvring at faster speeds gets progressively trickier. An extra life is awarded after each fourth level. Food Item: 10 points x level. Time Bonus: 10 points per remaing on clock x level. 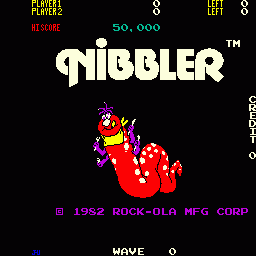 Nibbler does pause for a split-second when it hits a corner, so use this pause to decide your next turn. Try to collect the items on the inside of the maze first, as you can use the outer edges to move relatively safely when Nibbler is longer.